hi everyone I went to the Patrick MCarthy session at the Brisbane Martial Arts expo last weekend. 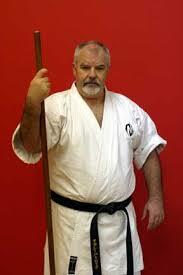 Sensei is well known internationally for his work on the origins of Karate with many opinions on him and his work. Most famously he published and further researched for a translation and interpretation of the BuBishi - which demonstrated it was the product of Chinese origins. With an interesting pedigree in many martial arts he demonstrated mostly from Koryu (ancient arts). His demonstration started with Tameshigiri (cutting mats with live blades), he then demonstrated a series of paired sword kata from the Tenshin Shoden Katori Shinto Ryu - which he introduced as templates. He jovially joked that he kept losing - but of course thats his job as the teacher in the koryu arts to take this role. Following this he did some free sparring with bokken which was impressive to watch his control of ma-ai and ability to keep talking during breaks.